5 Star-Rated on Amazon, produced with aloha, love and extreme attention to detail by Sacred Lomi. Home Study Companion Course Available. 5 Star-Rated on Amazon, produced with aloha and love and with extreme attention to detail by Sacred Lomi. Home Study Companion Course Now Available. If you have taken a workshop with Sacred Lomi and are in our database, then you qualify for alumni pricing. Enabled for All Regions World-Wide! View Excerpts from our High Quality Videos! 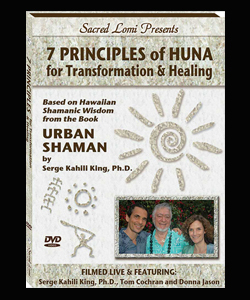 The Sacred Lomi® Volume One – Lomi Lomi DVD Video introduces and teaches all of the fundamental runs of Temple Style Hawaiian Lomi Lomi massage on the back of the body. 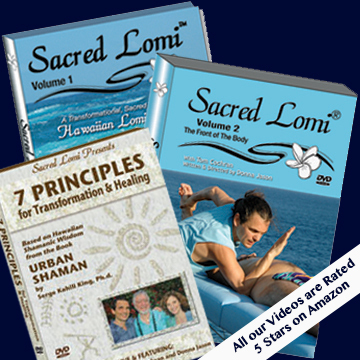 The Sacred Lomi ® Volume Two – Lomi Lomi DVD Video introduces and teaches all of the fundamental runs on the front of the body. Both DVDs are woven with beautiful images of Hawaii, historical drawings, an inspiring soundtrack and detailed, multi-angle shots of the flowing forearm massage techniques. Add on our HOME STUDY COURSE and earn NCBTMB & CMTO CE’s. Qualifies for most State CE’s as well. The fundamental forearm massage runs on the back & front of the body. A review segment that is a quick reminder of all of the runs. A final segment to demonstrate how the runs connect into a continuous flow. An accompanying small booklet adds important details about table height, draping, oil, body mechanics, breath and more.